The Oppo Find 7 has been a stunner ever since the company tweeted about it for the first time. One of its most awesome features is a 2560 x 1440p screen. 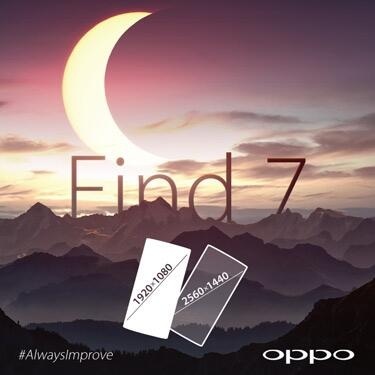 After surfacing for so long in rumors, the Find 7 smartphone finally has an official release date, right from Oppo’s Twitter account. Not only will the smartphone release in the coming weeks, but there will be 2 versions of it, both will come with 5.5-inch screens and while one will boast of the previously announced 2560 x 1440p screen, while the other will come with 1920 x 1080p full HD touchscreen. But that is not the only reason that there is so much hype around the Oppo Find 7. It may also come with a 50-megapixel snapper at the back. Some of the samples taken from this camera surfaced and well, they look pretty amazing. Oppo hasn’t as yet confirmed this feature, but we think we will get to know the whole story on March 19. Another rumored feature is a Snapdragon 805 processor. The Oppo Find 7 definitely looks like its going to have a big debut. Going by its features, it might compete with the likes of the Samsung Galaxy S5 and the Nokia Lumia 1520.